Our beloved Glory unexpectedly passed on after a sudden illness on Sunday, August 25, 2002. All of us at Goleta Valley Dog Club will miss our beautiful little friend and express our sincere condolences to Janet and her family. “Glory” is registered as “Braylane Glory Bee, UDX, OA, OAJ. This all means that she is a very, very obedient dog and was once ranked among the top ten obedience poodles in the country. 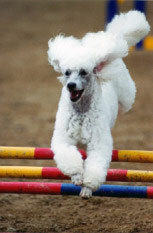 It also means that she is working very hard in Agility and still winning ribbons and titles at the ripe old age of ten! She’s part way through the Excellent level in AKC Agility and should finish this title this year.